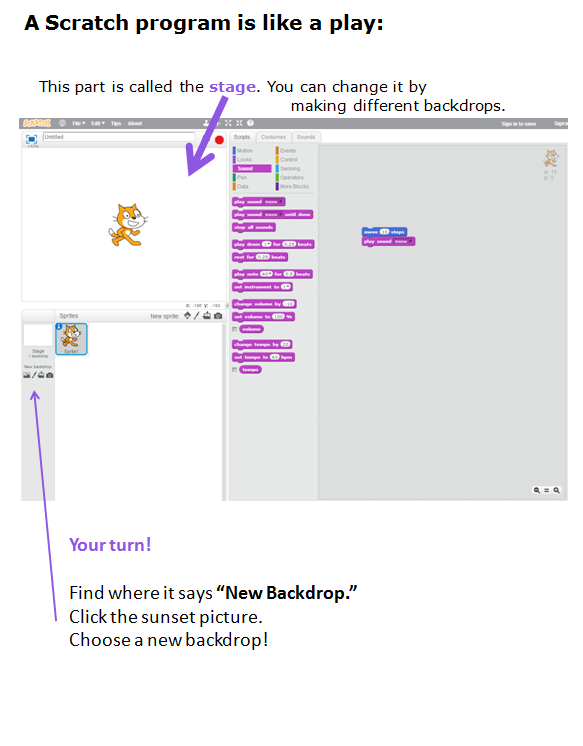 Scratch – Computer Science is for Everyone! Computer Science is for Everyone! At CoderDojo this weekend, I gave a spiel about Scratch programs being like plays (stage, backdrops, costumes, scripts) to new students and flustered parents more times than I can count, so I decided for today I’d make a printable set of uber-readable instructions for getting familiar with those terms. Since it’s Tooltime Tuesday again, I’m sharing it here. I’d love some feedback as to how it could be written, use color, or balance whitespace and print more effectively! I’ve had vaguely related notions percolating in my head for a little while, our chat really brought the question into focus. A lot of what I’ve said here is starting to feel like old hat, and I have a sneaking suspicion that a lot of the things I tag “objection overruled” are straw man arguments anyhow. It’s not hard to convince people that programming is important and to try an hour of Scratch, really. The trouble now, though, is that we’re still thinking of that as the absolute cutting edge…and it’s not. Scratch has been around for nearly a decade, which means current middle schoolers have few (if any) memories of a world in which tools weren’t being developed to teach them to code. For us old folks (and there I refer, I think, to myself and anyone else who remembers life pre-touchscreen), the last decade is a small enough portion of our lives to feel relatively current, and it’s tough to confront that that may not be the case. It’s also tough to confront that regardless of our best efforts, we’re going to be surpassed not just by a couple of prodigies, but quite likely by large groups of kids. What I’ve been thinking about lately (and shared with them) is that if I were to get my wish and see widespread quality computer science education beginning in kindergarten or first grade, at what age will my students know than I do? I’ve always thought I wanted to teach middle school, but will junior high programmers have more skills than I do? Certainly by high school, much of what I had to get a BA in computer science to learn will be routine for students. Which leads us from ego stings to the actual pressing concern: who in the world will teach them? I suspect that part of the success of Scratch so far has been not only that it’s easy for students to catch on to, but for teachers as well. You don’t really need programming background to pick up enough to introduce kids to computational thinking and thereby to be doing enough to pat yourself on the back for offering a nifty STEM opportunity. And maybe that was the point: maybe the hope is that teachers who get that taste will go on to learn and then teach more programming the same way that their students are supposed to. That hardly seems like a scalable solution to me, though. So I leave you, then, with the same question our conversation more or less derailed on: who will teach the ladder? As long as it’s still possible to work fewer hours and make more money as a software engineer, how in the world can schools hope to compete? By raising all teachers’ salaries to that level? (If only…). With some kind of TFA-style program where web devs agree to teach for two years? (errmmm…). By realizing that a changing world means changing solutions, and embracing some combination of flipped classrooms, MOOCs, and interactive web tutorials? I have some thoughts, but for today, it’s time to climb off the soapbox. Boys, if you’re reading this, I hope you could see how infectious your enthusiasm and absolute earnestness were. We need people like you on this team – people who haven’t gotten jaded by years of red tape and legislation and budget cuts, whose solution to, “Not all schools can afford computers,” is “Well, we have fundraisers and stuff all the time!”, who remind me that programming not just my dream job to teach but also your dream class to take. I hope our paths cross again!